Make a great impression. Thermoplastic coating over # 11 ga. punched steel with rolled edges gives this portable outdoor table the beauty and grace to enhance any setting. The octagon shaped top is 46". 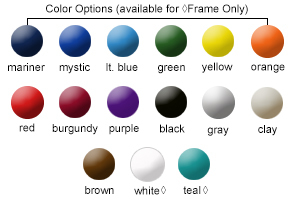 The powder-coated frame provides additional durability. Ideal for patios, terraces or any outdoor eating area. 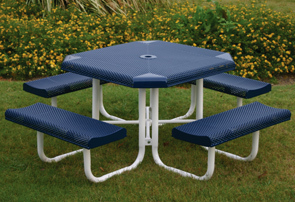 The table top and seats are available in any of the color options shown below, finished with a slightly textured Polyethylene coating. Optional umbrellas and a plastic/concrete Umbrella Stand are available to order. Surface Mount Clamps and In-ground Mount Posts can also be ordered to help protect against the possibility of undesired movement of the octagon outdoor table.